“Although today they have shut down newspapers, filtered websites, imprisoned many of our dear friends, closed down the office of [reformist] parties including the Etemade Melli office and even my personal office, although they fired shots at my car, although some are threatening everyday and are insulting Mir Hossein Mousavi, me and the great nation of Iran in every way possible and take our words out of content, but I am firmly announcing that I never compromise over people’s rights and one of the main rights of this nation is their votes that they casted in the ballot boxes while trusting the authorities; and I will be with the people till the very end and will try for holding free elections and eliminating current obstacles." "It was reported by Fars News, Iran’s official news agency, that Mehdi Karoubi has officially recognized the status of Iranian President Mahmoud Ahmadinejad. EA staff had a conference late last night to go over all the information we have --- from websites and sources inside Iran --- on Mehdi Karroubi's statement, reflecting on the Presidential election and his acceptance of Mr Ahmadinejad as the "head of the government of the regime" because it had been decreed by "Mr Khamenei". The Latest from Iran (26 January): Now for the Follow-Up…. The Latest from Iran (25 January): Who Makes A Move Today? Due to the fact that Mr Khamenei has 'confirmed/given legal validity to the decree which stated that Ahmadinejad has been elected, for this reason, I consider him [Mr Ahmadinejad] to be the 'head of the government of this regime'. And it's not the Supreme Leader but "Mr Khamenei". That is not a slip, because the statement has been unchanged on Saham News for hours. And that is not respect but an insult. 2. DID KARROUBI INTEND TO TAKE THIS STAND? This is still not clear, given the chain of events. The confusing series of events started when Karroubi spoke with a group of reporters Monday morning. What he did not anticipate was that Fars News, having asked the question whether Karroubi accepted that the June Presidential election was legal, printed his answer as a recognition of Ahmadinejad as "the President". So, in one sense, Hossein Karroubi's series of interviews throughout the day and even the Saham News statement were "damage control", protecting his father against charges that he had sold out to the regime. "Damage control", however, did not require that Karroubi take his political shots at Mr Khamenei and "the head of the government of the regime". So whether or not the cleric started the morning with a plan for a fight or whether he was bumped into it by the Fars episode, the outcome is the same. 3. THIS HAS NOTHING TO DO WITH THE CHALLENGE OF THE "ESTABLISHMENT WITHIN". My first attempt at analysis connected the Karroubi manoeuvre with the initiative by Ali Larijani-Mohsen Rezaei-Mohammad Baqer Qalibaf to curb or even topple Ahmadinejad. Just forget I wrote that --- I was wrong. The interesting sub-plot today has been obvious "clear blue water" between Mehdi Karroubi and Mohammad Khatami. As Saham News was putting out the right line on Karroubi v. Khamenei/Ahmadinejad this afternoon, it was also taking shots at former President Khatami. In particular, Saham News was playing up the story --- which has not been confirmed --- that Khatami had sent a letter to the Supreme Leader seeking reconcilation. What's more, Saham was pressing the point that Khatami had "recognised" the current Government, thus distinguishing his position from that of Karroubi. Why the divergence? Well, that's a story to be considered over following days. But let's be clear: Mehdi Karroubi is out front on this political challenge. 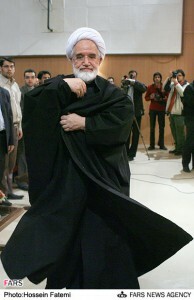 But is Karroubi also far ahead of Mir Hossein Mousavi? So far Mousavi has been silent on the day's events, apart from his website Kalemeh reprinting the Saham News statement. As we broke up the meeting tonight, an EA correspondent said, "You know, Karroubi may well have another statement out when we wake up in the morning." Indeed, he could, even to the point of issuing another clarification that withdraws/modifies his "Mr Khamenei" position. But, at the least, we can't see Karroubi withdrawing his now sustained condemnation --- sometimes explicit, sometimes in a bit of coding, as today --- of President Ahmadinejad. At most, he separates Mr Khamenei from his criticism. So pull back all those headlines that came out earlier today (and are still in some "Western" publications). This is not recognition of the President. This is, to adopt a US term, "dis-respecting". It's not a question of if, but how far, Karroubi wants to push it. A comment on the issue of Ayatollah vs. Mr used to refer to Khamenei. In Iran, Mr. Khamenei is commonly used to refer to the Supreme Leader and is not offensive in nature. Generally, he is called Mr. Khamenei, not always Ayatollah. unlike what Kim is saying, I can assure you that in the Islamic Republic internal politics, The supreme leader is never called "Ayatollah Khamenei" let alone "Mr. Khamenei", specially when it comes to formal conversations. The supreme leader is always referred as "The Supreme leader" (in Farsi: Maghame Mo'azzam Rahbari), calling him "Ayatollah" or "Mr." not only is not polite, but it is kind of insulting and it might mean that you do not consider him as the "leader" if you do not call him "Supreme Leader". Exactly like Imam Khomeini (the founder of the revolution), he never used to be called Mr. Khomeini. I believe (and I may be wrong) Kim was referring to the Farsi word “Agha” which means "Mr." in English. mr azadi is very right. publicly khamenie is never refered to other than 'supreme leader' . megan comment is quite ambigiuos and confusing but wrong as well. but anyway how karubi reffered to khamenie is kinda irrelevent. his expressed opinion is more important. What is ambigious abot what I said? He should have just referred to him as haji agha. Me personally I always just call him Ole Shifty-eyes. Always looks like he's looking over his shoulders...probably to see if the snakes are showing! The fact that you “ just do not get it” is an understatement. I was on topic. I was trying to offer a possible explanation for what Kim might have meant. I stated a fact that Mr. is one translation for Agha. Others are gentlemen and Sir. Please watch you words before you characterize other people comments. There was nothing “ambiguous” about Agha=Mr. If you ask me he is a pathetic Common Criminal and SL stands for Supreme Loony. And I spell his last name as Khannei. That picture prompted the Obi-wan Karroubi name. I think You and Mr. Azadi are quite right . is equivalent to calling him "master" or "head of the family " . (as J/J puts ) Obi-wan Karoubi has regarded Khamenei in his declaration. Peace Maker, I think I get it, like we have the English phrase "The Man". If you were to say The Man when you were talking about Obama without using his name, it would be a compliment, but if you said "the man Obama" it would be a way to point out that he's just another man. Well actually "The Man" isn't always a compliment, I forgot it can also be a euphemism for The Establishment or those in power trying to maintain the status quo. It is looking like Karoubi made a mistake in speaking to the Fars News reporter yesterday. It seems not to have been an interview (unline what Fars says) but Karoubi was asked a question in passing on the fringes of the Mardonsalari Party congress. He seems to have answered a question the reporter had asked him whether he (paraphrasing) “accepted the legitimacy of the popularly elected president” (this is basically how reporters in IRI interview people; they make a statement which is pro-SL and ask the “interviewee” to confirm it. There could be severe consequences if you don’t confirm the statement). Karoubi and the people around him seem to be trying to clear up the mess now. The Jaras report about Ali Larijani’s son being arrested on Ashura and details about Khatami’s letter to SL may be part of this cleaning up process, where they throw a couple of punches at SL & co to remind that they can hit back. The remark about snakes on his shoulders is the best. Thanks for the link to the Karoubi “interview” with Fars. The text in the blog post says that in response to the question from the Fars “reporter” (apparently a repeat question), Karoubi nods. I didn’t see a nod. He just kisses the guy on the forehead, in what looks like a condescending way. Does anyone else see him nodding? Also, is Fars News basing report of its interview with Karoubi on this exchange (if you can call it that)?! Surely, they can’t be that desperate yet. megan now i can say you are wrong and confused. peacemaker comments are absaloutly correct and offer a better explanation to the topic we are discussing. i think it sums it up perfectly. josh&joanna, like that 'obi one karubi' remark. very funny. and i guess we all know who darth vader is. Mehdi Karoubi condemns rigged election and violence on people one more time!